Many of the greatest unsolved mysteries in the world surround the Bermuda Triangle zone. This zone is not officially recognized on any type of map that is official based. The term used to describe this mysterious area of the world was first introduced in the year of 1964 where the area was identified as the "Bermuda Triangle". Throughout history, many water vessels, aircraft, and individuals have seemed to simply disappear with no trace. Many claim that the disappearances never really happened; others claim that aliens, black holes, parallel universes, and UFOs are to blame. Whatever the reason behind the disappearances of this particular area, individuals everywhere agree that they are some of the greatest unsolved mysteries of all time. The group known as "The United States Board of Geographic Names" does not recognize the area as anything more than simply an imaginary area. However, for individuals affected personally by the losses in the area, the "Devil's Triangle" is very real. This area is located in an area off of the coast in the Southern part of the United States. It rests in the Atlantic Ocean. The points of the this zone are located in Bermuda, the city of San Juan in Puerto Rico and the city of Miami in Florida. The estimated square mileage of the Devil's Triangle ranks in at an amazing five hundred thousand. Throughout this page, you will be introduced to several different stories surrounding the greatest unsolved mysteries that have occurred in the Bermuda Triangle zone. You will learn about the strange disappearances of United States Military aircrafts, the mysteries of immense ocean liners practically vanishing off the face of the earth, and numerous losses of life in the Devil's Triangle. You will also be introduced to stories retold of individuals that were able to make it back to the mainland after experiencing strange phenomena in the mysterious triangle. Sit back and enjoy learning about the greatest unsolved mysteries of the most mysterious triangle of the world. Would you like to share your knowledge, thoughts or experiences related to the triangle? If you want to share your opinion on the incidents that have occurred in the area, or have had a direct experience in the Bermuda Triangle zone – share it here! Regardless of which is myth, or which is fact, the Triangles location is a reality. A reality that many are still puzzled by. Traveling through "The Devil's Triangle" can be a frightening proposition. The loss of the USS Cyclops has been deemed as the largest loss that has ever occurred as far as ships directly under the control of the U.S Navy is concerned. In the year of 1945, five aircraft and fourteen men were lost forever in the "zone". It is believed that it is the leading cause for the many disappearances of aircraft, water vessels, and individuals throughout history. 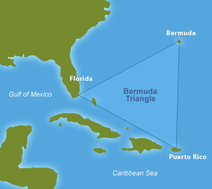 Many of the greatest unsolved mysteries in the world surround the Bermuda Triangle zone. Nearly everyone that has read about this location or watched media pertaining to the area have their own thoughts or level of expertise surrounding the region. Now, you can create your very own page pertaining to the mysteries of the area! It does not matter if you simply want to expound on a certain incident, want to share your opinion on the incidents that have occurred in the area, or have had a direct experience in the Bermuda Triangle zone – share it here!